WCRE (Wolf Commercial Real Estate) reports that the South Jersey commercial real estate market exceeded several of its third quarter benchmarks, despite uncertainty caused by a natural disaster and other major news events. The latest quarterly analysis from WCRE, a premier South Jersey Commercial Real Estate Broker, found that while the third quarter was marked by caution, the fourth quarter market proved its resiliency. “Though Hurricane Sandy, the election, and the threat of the temporarily-resolved fiscal cliff exerted pressure on businesses, investors, and consumers, there were signs of accelerated growth and reasons for optimism amid the overall climate of cautiousness,” said Jason Wolf, founder and principal of WCRE. According to WCRE, the fourth quarter showed a significant uptick in both new deal activity and expansion in the market for Southern New Jersey office space and other Southern New Jersey commercial properties. Several deals of significant size were completed, and South Jersey office properties and other South Jersey commercial properties in prime locations performed better than the overall market vacancy rate. There were approximately 389,000 sf of notable Southern New Jersey commercial property deals executed in the market, a nearly 25% increase over the third quarter. This includes new lease and expansion transactions of approximately 235,000 sf. Notably, expansions and new deals for South Jersey office space and other South Jersey commercial space outpaced lease renewals this quarter. — Average rents for Class A & B product remained at the improved level they reached earlier this year, continuing to show strong support in the range of $11-$14.00/sf NNN with an overall market average of $11.00/sf NNN for the deals completed during the fourth quarter. — New deals and expansion transactions of 235,000 sf for the fourth quarter was more than double the third quarter mark of 106,000 sf. — Moorestown, Marlton and Mount Laurel (3M) continue to show strength, while a large share of the region’s vacancies remain in Voorhees, Pennsauken, and the west side of Cherry Hill. Burlington County continued to maintain a significantly lower vacancy rate than Camden County. — Tenants continue to take advantage of low rental rates and are securing long-term lease commitments. The pattern of this flight to quality – upgrading to better locations and spaces – is expected to continue, especially among larger firms. — All of the new major owners and REITS are showing a significant increase in deal activity and occupancy – both renewals and new deals – and are all cautiously optimistic. — Moorestown has issued its first ever liquor licenses, and PREIT acquired them in order to bring four new high-end restaurants to the Moorestown Mall. — Overall South Jersey retail space vacancy is still hovering in the 17-18% range, but the market has stabilized, and prime retail locations have very little vacancy. — Average rents for Class A retail product continue to show strong support in the range of $30-$40.00/sf NNN. Class B product shows support in the range of $15-$23/sf NNN. — The Haddonfield Road corridor, Route 70, and Route 73 are the prime destinations for retailers. The report also anticipated challenges in 2013, with at least 250,000 sf of additional Southern New Jersey office space and Southern New Jersey commercial space vacancies expected to return to the market as Lockheed-Martin, Catalent Pharma, and others follow through on plans to downsize. But Wolf said that even this development could be positive, because large blocks of quality South Jersey office space and other South Jersey commercial space in excess of 30,000 sf have become scarce. For more information about South Jersey office space for sale or South Jersey office space for lease, please contact Jason Wolf (856-857-6301; jason.wolf@wolfcre.com), Leor Hemo (856-857-6302; leor.hemo@wolfcre.com) or Scott Seligman (856-857-6305; scott.seligman@wolfcre.com) at Wolf Commercial Real Estate, the premier Southern New Jersey and Philadelphia region Commercial Real Estate Brokerage and Advisory firm. As real estate brokerage and advisory experts in Southern New Jersey and the Philadelphia region, the team at our New Jersey commercial real estate brokerage firm provides ongoing detailed information to our clients and prospects to help them achieve their real estate goals. Learn more about WCRE, a Southern New Jersey Commercial Real Estate Brokerage Firm, online at www.wolfcre.com, on Twitter @WCRE1, and on Facebook at Wolf Commercial Real Estate, LLC. Visit our blog pages at www.southjerseyofficespace.com<http://www.southjerseyofficespace.com/>, www.southjerseymedicalspace.com<http://www.southjerseymedicalspace.com/>, www.southjerseyland.com<http://www.southjerseyland.com/> and www.southjerseyretailspace.comhttp://www.southjerseyretailspace.com/. WCRE markets Southern New Jersey and Philadelphia commercial offices, medical properties, industrial properties and retail buildings for buyers, tenants, investors and sellers in such areas as Marlton, Moorestown, Mount Laurel, Cherry Hill, Voorhees, and Pennsauken. Please visit our websites for listings of Southern New Jersey office space for lease or purchase and other Southern New Jersey commercial real estate for lease or purchase or for information about medical space, retail space, office space or land for sale or lease from this Southern New Jersey Commercial Real Estate Broker. WCRE (Wolf Commercial Real Estate) is offering this premier Southern New Jersey office space for lease at 600 Cuthbert Boulevard in Westmont, New Jersey. This South Jersey office space, located in a full-service mid-rise office building at 600 Cuthbert Boulevard in Westmont New Jersey Camden County 08108, is available in three configurations: 9,868 sf on the first floor, 8,615 sf on the second floor and an additional 9,800 sf on the third floor for potential expansion. There is strong ownership and on-site management at this Westmont office space for lease. The asking lease rate for this Southern New Jersey office space for lease is $16.00 per square foot full service and the space is available for immediate occupancy. This South Jersey office space is adjacent to the Westmont Plaza shopping center as well as to several restaurants and banks. This premier South Jersey Office Building is within close proximity to the PATCO High-Speed Line and Cuthbert Boulevard and offers easy access to Routes 38, 70 and 130 as well as to all bridges to Philadelphia. An average of nearly 30,000 vehicles a day drive by this Westmont office space at 600 Cuthbert Boulevard and there are more than 140,000 residents living within a three-mile radius of this Southern New Jersey office space for lease. For more information about this Westmont office property for lease at 600 Cuthbert Boulevard New Jersey Camden County 08108, please contact Jason Wolf (856-857-6301; jason.wolf@wolfcre.com), Leor Hemo (856-857-6302; leor.hemo@wolfcre.com) or Scott Seligman (856-857-6305; scott.seligman@wolfcre.com) at Wolf Commercial Real Estate, the premier Southern New Jersey and Philadelphia region Commercial Real Estate Brokerage and Advisory firm. As real estate brokerage and advisory experts in Southern New Jersey and the Philadelphia region, the team at our New Jersey commercial real estate brokerage firm provides ongoing detailed information to our clients and prospects to help them achieve their real estate goals. WCRE markets Southern New Jersey and Philadelphia commercial offices, medical properties, industrial properties and retail buildings for buyers, tenants, investors and sellers in such areas as Marlton, Moorestown, Mount Laurel, Cherry Hill, Voorhees, and Pennsauken. Please visit our websites for listings of Southern New Jersey commercial real estate for lease or purchase or for information about medical space, retail space, office space or land for sale or lease from this Southern New Jersey Commercial Real Estate Broker. Our team of dedicated professionals is in place to provide the highest levels of commercial real estate research and information about Southern New Jersey office space and other Southern New Jersey commercial properties. Wolf Commercial Real Estate is creating a new culture and a higher standard of service. At WCRE, we learn about our client’s goals, make them our own, and integrate those goals into an enduring partnership. We go well beyond helping with property transactions and serve as a strategic partner invested in our client’s long-term growth and success. WCRE (Wolf Commercial Real Estate) is now offering premier Southern New Jersey office space for lease at 63 Kresson Road in Cherry Hill, NJ. This premier Cherry Hill, NJ office space has 2,900 square feet available for lease and the asking lease rate is $14.00 per square foot NNN. This Southern New Jersey office space for lease at 63 Cresson Road Cherry Hill New Jersey Camden County 08034 is available for immediate occupancy. Join Lourdes Health System in this fully fit-out medical/professional South Jersey office space at 63 Cresson Road that borders neighboring Haddonfield, NJ. Parking is abundant (5/1000sf) at this well-located Cherry Hill office space that is near the intersection Kresson Road and Brace Road in Cherry Hill and offers easy access to nearby Route 70 and Haddonfield Berlin Road. An average of more than 21,000 vehicles a day drive by this South Jersey office space at 63 Kresson Road and there are nearly 102,000 residents living within a three-mile radius of this Southern New Jersey office space for lease. For more information about this Cherry Hill office property for lease at 63 Kresson Road Cherry Hill New Jersey Camden County 08034, please contact Jason Wolf (856-857-6301; jason.wolf@wolfcre.com), Leor Hemo (856-857-6302; leor.hemo@wolfcre.com) or Scott Seligman (856-857-6305; scott.seligman@wolfcre.com) at Wolf Commercial Real Estate, the premier Southern New Jersey and Philadelphia region Commercial Real Estate Brokerage and Advisory firm. As real estate brokerage and advisory experts in Southern New Jersey and the Philadelphia region, the team at our New Jersey commercial real estate brokerage firm provides ongoing detailed information to our clients and prospects to help them achieve their real estate goals. WCRE markets Southern New Jersey and Philadelphia commercial offices, medical properties, industrial properties and retail buildings for buyers, tenants, investors and sellers in such areas as Marlton, Moorestown, Mount Laurel, Cherry Hill, Voorhees, and Pennsauken. Please visit our websites for listings of Southern New Jersey commercial real estate for lease or purchase or for information about medical space, retail space or office space for sale or lease from this Southern New Jersey Commercial Real Estate Broker. WCRE (Wolf Commercial Real Estate) is now offering approximately 13,000 square feet of premier South Jersey office space in Cherry Hill for sale or lease. These South Jersey commercial offices, at 1 Allison Drive in Cherry Hill New Jersey Camden County 08003, have an asking price of $1.275 million or an asking lease rate of $10 per square foot NNN and are available for immediate occupancy. 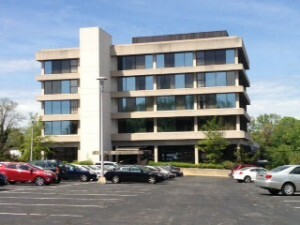 Parking is abundant at this Cherry Hill office space, which is located along one of the main business corridors of Cherry Hill off Marlkress Road. There’s excellent access from this Southern New Jersey office space to Route 70, Route 73, Interstate 295 and the New Jersey Turnpike, as well as to public transportation. 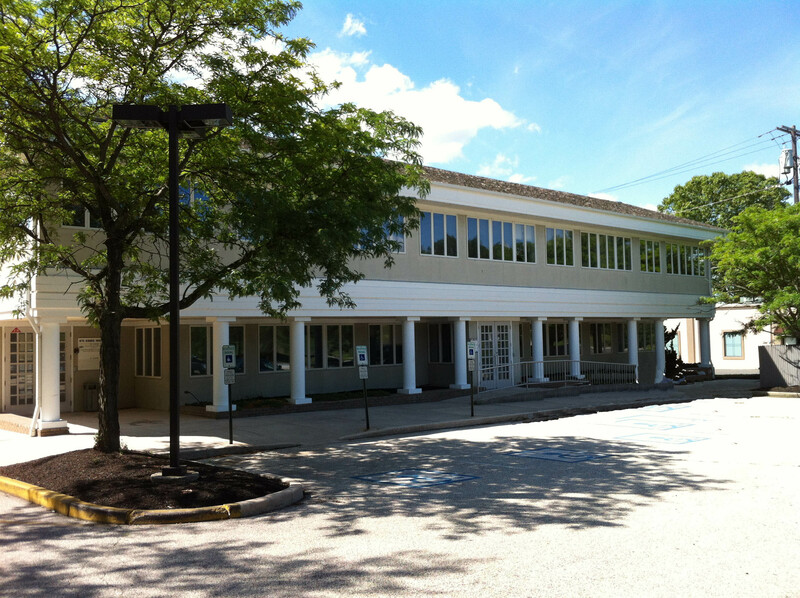 This Cherry Hill office property is located directly across the street from the Cherry Hill Post Office. 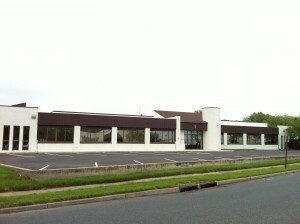 An average of nearly 89,000 vehicles a day travel through the nearby major intersection of Marlkress Road and the Marlton Pike next to this South Jersey commercial office space. There are more than 76,000 potential customers and employees living within a three-mile radius of 1 Allison Drive in Cherry Hill. For more information about these South Jersey offices for sale or lease at 1 Allison Drive in Cherry Hill New Jersey Camden County 08003, please contact Jason Wolf (856-857-6301; jason.wolf@wolfcre.com), Leor Hemo (856-857-6302; leor.hemo@wolfcre.com) or Scott Seligman (856-857-6305; scott.seligman@wolfcre.com) at Wolf Commercial Real Estate, the premier Southern New Jersey and Philadelphia region Commercial Real Estate Brokerage and Advisory firm. As real estate brokerage and advisory experts in Southern New Jersey and the Philadelphia region, the team at our New Jersey commercial real estate brokerage firm provides ongoing detailed information to our clients and prospects to help them achieve this real estate goals. WCRE markets Southern New Jersey and Philadelphia commercial offices, medical properties, industrial properties and retail buildings for buyers, tenants, investors and sellers in such areas as Marlton, Moorestown, Mount Laurel, Cherry Hill, Voorhees and Pennsauken. Please visit our websites for listings of Southern New Jersey commercial real estate for lease or purchase or for information about medical space, retail space or office space for sale or lease from this Southern New Jersey Commercial Real Estate Broker. WCRE (Wolf Commercial Real Estate) is now offering newly renovated South Jersey professional office space for immediate occupancy in West Deptford. This South Jersey office space, at 875 Kings Highway in West Deptford New Jersey Gloucester County 08096, is available at an asking lease rate of $15.00/sf NNN. You can lease anywhere from 1,000 to 9,000 square feet of this first-floor Southern Jersey professional office space. The large parking lot and common areas of this Southern New Jersey office space for rent have been completely renovated and there are other significant improvements taking place at these South Jersey offices for lease on both the interior and exterior of this commercial office building. Nearly 12,000 vehicles a day travel through the Kings Highway and Jessup Road intersection near this South Jersey office space and there are more than 62,000 residents within a three-mile radius. This available South Jersey professional office space for lease is located directly across from the Westwood Golf Club and is within close proximity to both Underwood Memorial Hospital and the Gloucester County Courthouse. In addition, this South Jersey office space for rent offers easy access to the New Jersey Turnpike, Interstate 295 and state Route 45. For more information about these South Jersey offices for rent at 875 Kings Highway in West Deptford New Jersey Gloucester County 08096 please contact Jason Wolf (856-857-6301; jason.wolf@wolfcre.com), Leor Hemo (856-857-6302; leor.hemo@wolfcre.com) or Scott Seligman (856-857-6305; scott.seligman@wolfcre.com) at Wolf Commercial Real Estate, the premier Southern New Jersey and Philadelphia region Commercial Real Estate Brokerage and Advisory firm. As real estate brokerage and advisory experts in Southern New Jersey and the Philadelphia region, our team provides ongoing information to our clients and prospects to help them achieve bottom line savings, reduce their costs, and mitigate their levels of risk. WCRE (Wolf Commercial Real Estate) is a full-service commercial real estate brokerage and advisory firm specializing in office, retail, industrial and investment properties. We provide a complete range of real estate services to commercial property owners, companies, and investors seeking the highest quality of service, proven expertise, and a total commitment to client-focused relationships. 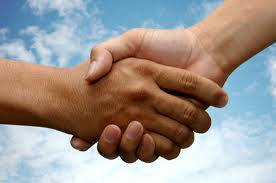 We value relationships more than any other aspect of our business. We’re connectors with the people, resources, properties, and partners that your company needs to achieve its goals. Through our intensive focus on our clients’ business goals, our commitment to the community, and our highly personal approach to client service, WCRE is creating a new culture and a higher standard. We learn about your goals, make them our own, and integrate those goals into an enduring partnership. We go well beyond helping with property transactions and serve as a strategic partner invested in your long term growth and success. Each WCRE client is treated as though they are our only client, no matter their particular need. Your goals become our goals. We understand how to think like investors, owners, and tenants,and we leverage our deep roots and extensive experience in Philadelphia, Southern New Jersey, and throughout the United States to connect clients with the properties, resources, and opportunities they need. For more information about WCRE, please contact Jason Wolf (856-857-6301; jason.wolf@wolfcre.com), Leor Hemo (856-857-6302; leor.hemo@wolfcre.com) or Scott Seligman (856-857-6305; scott.seligman@wolfcre.com) at Wolf Commercial Real Estate, the premier Southern New Jersey and Philadelphia region Commercial Real Estate Brokerage and Advisory firm. As real estate brokerage and advisory experts in Southern New Jersey and Philadelphia region our team provides ongoing information to our clients and prospects to help them achieve bottom line savings, reduce their costs, and mitigate their levels of risk. 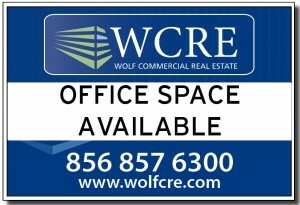 Learn more about WCRE online at www.wolfcre.com, on Twitter @WCRE1, and on Facebook at Wolf Commercial Real Estate, LLC. Visit our blog pages at www.southjerseyofficespace.com<http://www.southjerseyofficespace.com/>, www.southjerseymedicalspace.com<http://www.southjerseymedicalspace.com/>, www.southjerseyland.com<http://www.southjerseyland.com/> and www.southjerseyretailspace.com<http://www.southjerseyretailspace.com/>. 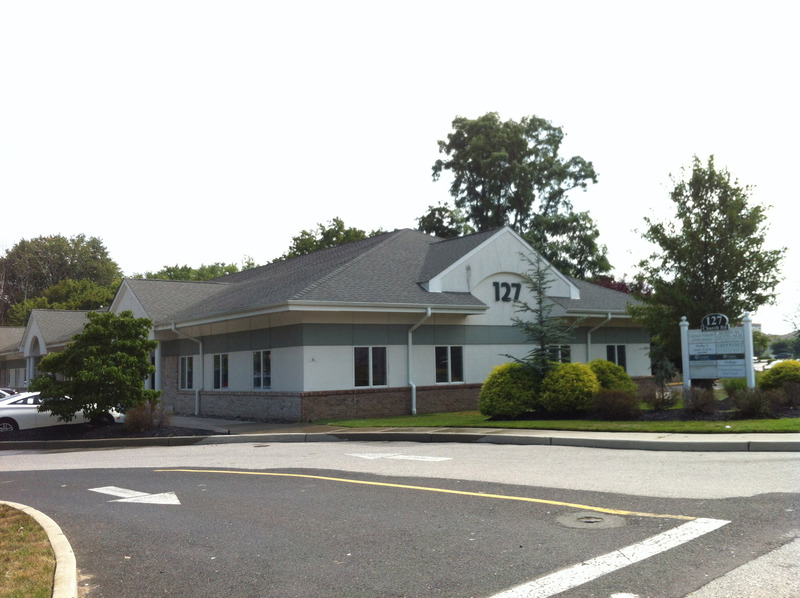 Wolf Commercial Real Estate offers two office suites at 127 Church Road in Marlton NJ as South Jersey office space available for rent. The two medical/professional suites ready for immediate occupancy in this Southern New Jersey office space are the 1,714-square-foot Suite 100 and the 1,346-square-foot Suite 600. The asking lease price for these South Jersey offices for rent is $20/sf gross plus utilities and janitorial for Suite 100 and $17/sf gross plus utilities and janitorial for Suite 600. These recently constructed Southern New Jersey offices for lease at 127 Church Road in Marlton New Jersey Burlington County 08053 offer easy access to both Route 73 and Greentree Road. Located in the Evesboro section of Evesham Township, this South Jersey office space for rent is in close proximity to Mount Laurel, Medford and Cherry Hill. Your fellow tenants in these Southern New Jersey offices for rent in Marlton will be a pediatrician, dermatologist, OB-GYN, dentist, urologist and a podiatrist. Your customers will find more than enough parking with 6/1,000 sf available spaces at this South Jersey office space for rent. An average of 18,000 vehicles a day pass through the North Maple Avenue intersection near this South Jersey office space at 127 Church Road in Marlton and there are nearly 64,000 potential medical/professional customers living within a three-mile radius. 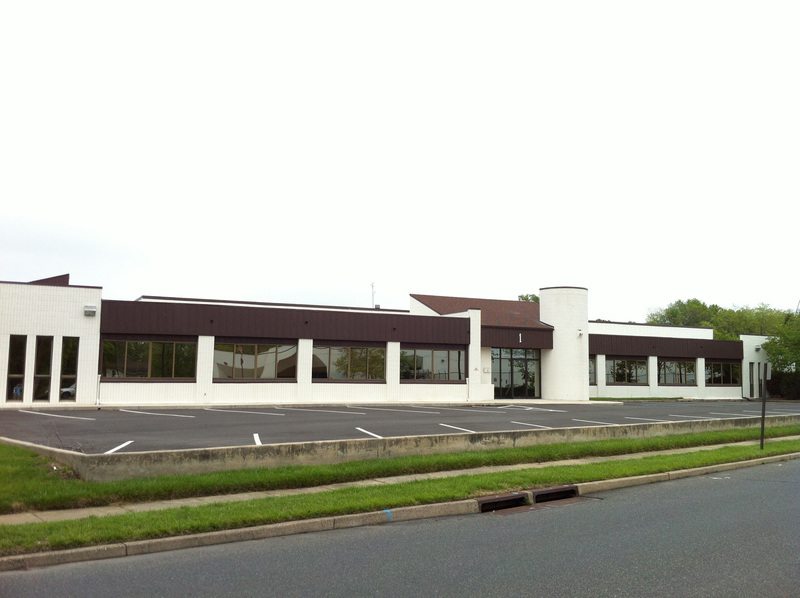 For more information about these South Jersey offices for lease in Marlton New Jersey Burlington County 08053, please contact Jason Wolf (856-857-6301; jason.wolf@wolfcre.com), Leor Hemo (856-857-6302; leor.hemo@wolfcre.com) or Scott Seligman (856-857-6305; scott.seligman@wolfcre.com) at Wolf Commercial Real Estate, the premier Southern New Jersey Commercial Real Estate Brokerage and Advisory firm. As medical space brokerage and advisory experts in Southern New Jersey, our team provides ongoing information to our clients and prospects to help them achieve bottom line savings, reduce their costs, and mitigate their levels of risk. WCRE markets Southern New Jersey and Philadelphia commercial offices, medical properties and retail buildings for buyers, tenants, investors and sellers. Please visit our websites for listings of Southern New Jersey commercial real estate for lease or purchase or for information about medical space, retail space or office space for sale or lease from this Southern New Jersey Commercial Real Estate Broker. Wolf Commercial Real Estate reports the Southern New Jersey office space market experienced a positive uptick in rental rates in 2012, even though overall office real estate vacancy rates remain stuck where they have been for four years — at 20% or higher. Southern New Jersey office space rental rates have increased on average from $7-to-$9 per square foot NNN to the $11-to-$13 per-square-foot NNN range, according to a year-to-date report from the Voorhees NJ-based company. Nonetheless, it remains a tenants’ market. Tenants in the market for 10,000-40,000 square feet who are considering a “flight-to-quality” have ample opportunity to negotiate on rent for Class A South Jersey office space, Wolf notes. The stubbornly high South Jersey office vacancy rate continues to enable all tenants to negotiate for better lease terms. 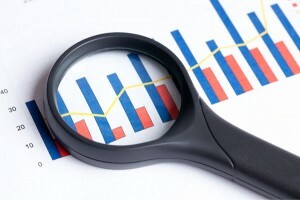 “Even with slow economic recovery underway, this pattern is expected to continue until the market sees significant positive absorption and a better jobs outlook,” the WCRE analysis said. Wolf Commercial Real Estate surveyed availabilities at class A and B buildings with up to 100,000 square feet in Cherry Hill, Marlton, Moorestown, Mount Laurel, Pennsauken and Voorhees. Overall, Mount Laurel had the most Southern New Jersey office space available of any of these communities, with almost 50 offices of 10,000 square feet or less currently on the market, along with a significant supply of larger offices. * WCRE can analyze your current lease situation and determine whether and when it would be prudent to relocate to quality or renegotiate more favorable terms on existing space. * WCRE will create a valuation matrix that includes your financial situation, property needs, and available alternatives. * WCRE can develop negotiating strategies based upon our extensive knowledge of the market and the financial position and reputation of individual landlords. * For tenants with a remaining lease obligation, WCRE can negotiate a restructuring or early termination of the lease, or we can represent you in a sublease arrangement. If you have a need for South Jersey office space, a lease expiration coming due, or want to learn more about these opportunities, please contact Jason Wolf (856-857-6301; jason.wolf@wolfcre.com), Leor Hemo (856-857-6302; leor.hemo@wolfcre.com) or Scott Seligman (856-857-6305; scott.seligman@wolfcre.com) at Wolf Commercial Real Estate, the premier Southern New Jersey Commercial Real Estate Brokerage and Advisory firm. As office space brokerage and advisory experts in Southern New Jersey, our team provides ongoing information to our clients and prospects to help them achieve bottom line savings, reduce their costs, and mitigate their levels of risk. WCRE is a full-service commercial real estate brokerage and advisory firm specializing in office, retail, industrial and investment properties in Southern New Jersey, thePhiladelphia region or anywhere in the country. We provide a complete range of real estate services to commercial property owners, companies, and investors seeking the highest quality of service, proven expertise, and a total commitment to client-focused relationships. Through our intensive focus on our clients’ business goals, our commitment to the community, and our highly personal approach to client service, WCRE is creating a new culture and a higher standard. We go well beyond helping with property transactions and serve as a strategic partner invested in your long term growth and success. WCRE markets Southern New Jersey and Philadelphia commercial offices, medical properties and retail buildings for buyers, tenants, investors and sellers. Please visit our websites for listings of Southern New Jersey commercial real estate for lease or purchase or for information about retail space, medical space or office space for sale or lease from this Southern New Jersey Commercial Real Estate Broker. Wolf Commercial Real Estate (WCRE), headquartered in Southern New Jersey, is a full-service commercial real estate advisory firm specializing in office, retail, industrial and investment properties. WCRE specializes in helping companies and individuals sell and/or lease their office space in Southern New Jersey, the Philadelphia region, or anywhere in the country. WCRE helps property owners and landlords sell and/or lease their office space using a defined marketing process that we tailor to each property and sub-market with a very detailed, fundamental approach. Some examples of the steps in our process include distributing a detailed professional press release, creating brokerage community awareness about the office property, online outreach, social media, and targeting prospects within relevant industries. Wolf Commercial Real Estate professionals have the local experience to treat your office properties as if they were our own. We are hands on and responsive to our clients’ needs and goals. For more information about owner representation, landlord representation or office space for sale or lease in Southern New Jersey, the Philadelphia region or anywhere in the country, contact either Jason Wolf (856-857-6301; jason.wolf@wolfcre.com), Leor Hemo (856-857-6302; leor.hemo@wolfcre.com) or Scott Seligman (856-857-6305; scott.seligman@wolfcre.com) at Wolf Commercial Real Estate, the premier Southern New Jersey Commercial Real Estate Brokerage and Advisory firm. Wolf Commercial Real Estate (WCRE) is a full-service Southern New Jersey and Philadelphia region commercial real estate brokerage and advisory firm specializing in Southern New Jersey and Philadelphia commercial offices, medical properties and retail buildings for buyers, tenants, investors and sellers. Please click the links below for listings of Southern New Jersey commercial real estate for lease or purchase or for information about office, retail or medical space for sale or lease from this Southern New Jersey Commercial Real Estate Broker.